Women who have dementia start losing weight at least 10 years before the disease is diagnosed, a new study shows. The same findings were not observed in men, though researchers are not sure why. The findings were published in Neurology, the medical journal of the American Academy of Neurology. Looking at the long-term health and medical records of 481 people with Alzheimer’s and other forms of dementia living in Rochester, Minnesota, the researchers found that women started losing weight 10 to 20 years before their disease was diagnosed. On average, at the time dementia was diagnosed, the women with dementia weighed 12 pounds less than their peers who remained mentally sharp. The average weight was the same for women with dementia compared to women without dementia 21 to 30 years before the disease was diagnosed in the dementia patients. Unlike women, men in this study who later developed dementia did not lose weight in the years before diagnosis. Dr. Knopman said the difference could be due to hormones, but a social reason seems just as likely. Earlier studies have suggested that both men and women may lose weight in the months preceding a diagnosis of Alzheimer’s. Changes of old age, such as reduced appetite, poor mobility, general frailty, and diminishing height, cause many otherwise healthy seniors to lose weight. Men and women with Alzheimer’s disease also tend to be thinner than those without the illness. Poor appetite, disorientation, problems with visions and perception, and an inability to feed oneself can all contribute to poor nutrition in those with the disease. During the late stages of Alzheimer’s, people commonly lose up to two pounds a year. Those who lose the most weight are more likely to do worse and to be placed in a nursing home. Other studies have found that being obese during middle age increases the risk of Alzheimer’s. [See the article, “Middle Aged Spread Tied to Poor Thinking and Memory.”] Obesity is also associated with diabetes, high blood pressure, and heart and blood vessel disease. Scientists also speculate that fat cells may produce harmful chemicals that promote inflammation in blood vessels throughout the body, including the brain. People who are overweight may also tend to have diets low in “good” fats, such as those found in fish, that can promote healthy blood vessels. Regardless of whether someone is overweight or underweight, good nutrition is critical for seniors, particularly those with Alzheimer’s disease. The symptoms of Alzheimer’s disease, even during its early stages, may be made worse when an individual does not receive adequate nourishment. 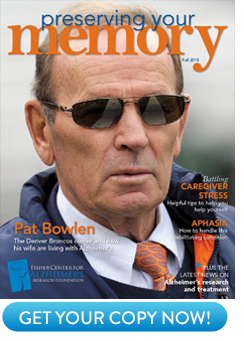 For more on the care and management of Alzheimer’s disease, visit www.ALZinfo.org. D. S. Knopman, M.D., S. D. Edland, Ph.D., R. H. Cha, M.S., et al: “Incident Dementia in Women Is Preceded by Weight Loss By at Least a Decade.” Neurology, Volume 69, August 21, 2007, pages 739-746.